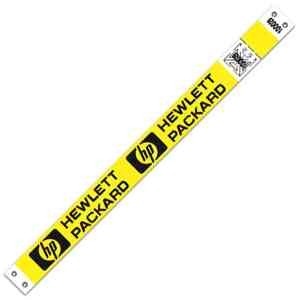 Same Day Service: Same Day Service - Keep security tight with this one time use, 1"H x 10"W wristband. Excellent for extended wear and features waterproof adhesive which guarantees to stay on in the water. Customize for any event with bar codes, customer numbering, or company name/logo. Made with DuPont Tyvek. Great for sporting events, concerts, and water parks. Totally adjustable and comfortable to wear. Sequentially numbered for added accountability. Recommended wear time is 1-3 days. Made in USA. Available in multiple colors. 100% recycled material, CPSIA Certified. Bar code and custom imprint available. Please contact us for more information.